Yup, sad but true - so true that it actually happened to me about a month ago. Seriously - all of the above - for a project which we lost in Singapore. Let's not elaborate as I might get depressed again! But, gosh.. since when did this become a known fact? I never knew this before I took up architecture - or as dear hubby would call it : archi-torture! 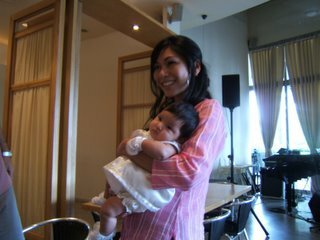 Introducing Sharifah Sarah - the precious baby of a friend. It's mesmerizing to see how small everything is of a baby - the fingers, the toes, the arms, the nose! It's incredible to see how this little 'thing' personafies the union between two souls. It's daunting to think that the values and character of this pure innocent thing will depend so much on you as parents. It's exhilirating to think of the joy she will provide you in your years ahead. It's touching to see how suddenly your friend changes to become a mother, and has this extension to her life. It makes me want to have a baby too! Hopefully some day..
p/s Thanks Shahriman for the photo! I have a new project at work which I think has the potential to be quite exciting. To start with, it's tiny and the site is very complex in context. The reason why it might be exciting if it's tiny is that I might actually see it get built! This is quite rare in my office as we work on mostly big projects and overseas most of the time. The design brief for this project is a jungle theme, and this image comes to my mind. This was at FCC in Siem Reap which is an absolutely stunning hotel with great ambience. I highy recommend it to people who are interested to visit the Angkor Watt and many other amazing temples there. 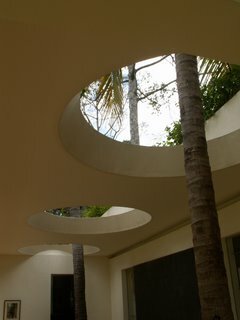 This is just an example of how sensitive the architecture is on the site that is part of the city's parks. The buildings make way for trees and vegetation - literally. I have just realised that my blog is kind of boring.... and this is precisely the reason why it's been a secret blog that only my dear husband knows about! Also, I wasn't sure if I was going to be consistent with my writing or simply.. as the Malays say it "hangat-hangat tahi ayam"! But I think I have been better than expected, and in fact am quite enjoying blogging! However, I do realise that I have to write more often, or people will be completely bored of my blog! So I came up with this *genius* idea of writing about a particular photo from our travels or whatever really, and hopefully can interact more with others (Yes - I'm starting to feel like I'm talking to myself...) Now, I just have to tell some friends about my blog. So far I have been too embarassed to 'publicise' it! So guys, please interact with me!! Cheers! I have just lost two things. Firstly, (I know this sounds really lame) but my brother's school trousers in Perth! Thinking of being a good sister, I washed, ironed and am pretty sure hung the trousers on one of the hangers with his school shirt on it. It is absolutely bizarre, but it's not there! And it's really expensive you see.. sigh.. Anyway, I guess it's silly to be so upset and stressed about these things when many others are losing more important things in life which perhaps can't even be replaced. What's making me worry though, is just that it feels like a bad sign. Well, touch wood. I really don't want to lose anything anymore at the moment! Been here for 5 days and leaving back for KL today - which is exciting to see my hubby whom I miss lots, but sad as this place brings me a lot of joy and happiness. Being away after living here for 5 years made me see clearly how life here is celebrated in a real sense - spending time with friends, enjoying the summer in the park, good wines, the beach. Even the fashion which I love reflects its summer spirit - the colours, patterns, light fabrics, summer dresses and of course lots of skin baring! 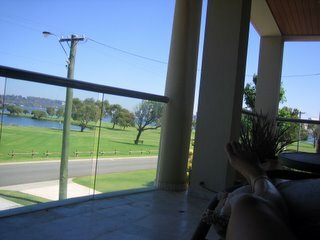 It makes me realise how much I miss this place. 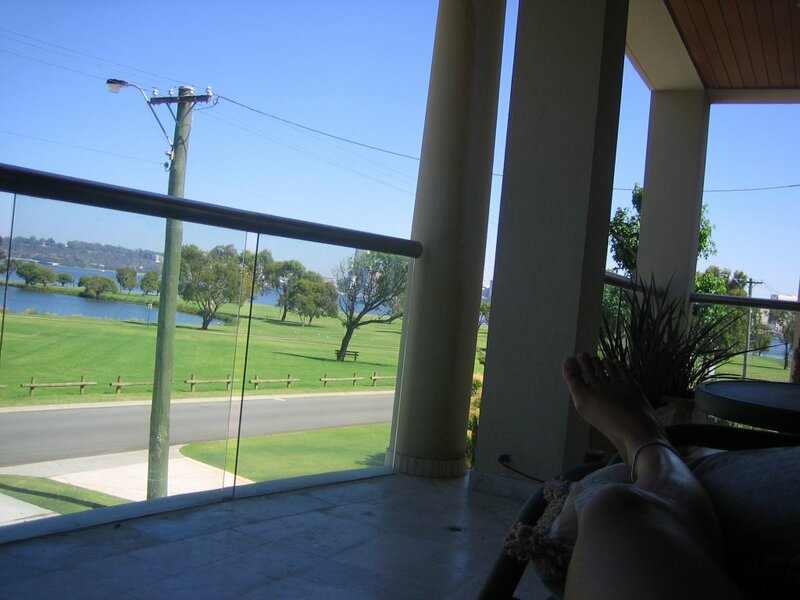 Relaxing on the swing on the balcony of the house, with the view of the lake and the backdrop of the city; flashed back so many sweet memories of hubby and I. I could see Kings Park with its majestic eucalyptus trees - and it brought back memories of how we were admiring each other quietly during one of the cultural show practices there! It was beautiful at night in winter and just so romantic. This park in front of the house witnessed the blooming of our relationship with many beautiful walks we had in summer, winter, spring, autumn. I could also see the Hartley Poynton building where he used to work and we would meet for lunch. Now it is time to go, but the only thing that can make me feel alright is the fact that we will come back soon - it is afterall our second home..